Once again, Levittown’s John R. Ferretti Jr. is at a crossroad. He’s battling head-to-head against Nassau County Executive Laura Curran. 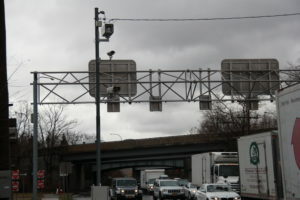 This time, the legislator wants answers about red light cameras, those pesky poles that nail drivers with a hefty fine. Sometimes, people do indeed blow lights and are held accountable for their actions. But that hasn’t been the only thing to get people tickets in Nassau. Ferretti and the other county legislators voted to enact a law that would require the county to install signs that direct drivers on restrictions, like not being allowed to turn on red at a given light or to stop in a specific spot to not trigger the cameras. The law was enacted on Dec. 20, 2018. The signs, though, haven’t gone up as planned. When March 1 came around, the deadline to finish the work surrounding the cameras, a percentage of the signs were not put up. Ferretti wants to know why. When Ferretti held a March 15 press conference to call out the Curran administration, she fought back. 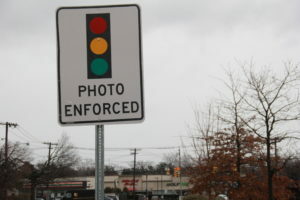 Curran’s office said the “Photo Enforced Advance” signs are 99 percent complete. However, “Stop Here on Red” signs are only up at 30 percent of the deemed locations. But that’s unacceptable, according to Ferretti. He said when the bill was first introduced, the county itself asked for the March 1 deadline, pushing it back so things wouldn’t be rushed and completed in a proper manner. But if people aren’t actually running red lights, is that acceptable? It was like that before Laura Curran took office!